Stoic Week 2014 is an online and international event taking place from Monday 24th to Sunday 30th November. This is its third year. Anyone can participate by following the daily instructions in the Stoic Week 2014 Handbook, which will be published online. You will be following the Stoic practices of philosophers such as Marcus Aurelius, Seneca and Epictetus, for seven days, and discussing the experience of adapting them for modern living with other participants in our online forums. The aims of the course are to introduce the philosophy so that you can see how it might be useful in your own life and to measure its potential therapeutic effectiveness. About Stoicism: Stoicism was first practised in the Graeco-Roman world in around 300 BC. At the core of Stoicism is the idea that virtue, or strength of character, is the most important thing in life. They focussed on ‘following nature’ by perfecting the rational nature of the human being, through cultivating wisdom, courage, temperance and justice, and also on bringing to fruition the social nature of the human being, by aiming to excel in our social roles, whether familial or in society at large. Stoicism, therefore, is simultaneously a philosophy of inner strength and outer excellence. About the course: The course guides you through all the basic ideas of Stoicism. Each day has its own theme, exercises to practise, reflections from original Stoic texts to consider. It has been written by the Stoicism Today team, an interdisciplinary group of academics and psychotherapists. You are also encouraged to take wellbeing surveys before and after the week, so that we can measure the course’s effectiveness. 1. Create an account on modernstoicism.com if you don’t have one already. 2. Visit the main course page for Stoic Week 2014 and click the ‘enrol’ button. You will receive an automatic email with further instructions. Want to share your experiences during the week? There will be very active discussion boards during Stoic Week on the course website. You can also post your reflections on the Stoicism Facebook group. I would like to meet other people interested in Stoicism face to face not just online. How can I do this? If you live in the UK, there is a one-day event being held at Queen Mary, University of London, on November 29th. There are 300 places for the event, so you should book now to avoid disappointment. Click here for more information. Videos and audio recordings of this event are planned, and will be uploaded onto the Stoicism Today website in the weeks that follow Stoic Week. You can see a video of last year’s London event here. There are also other events being organised around the world. Click here for a round-up of these events. Get in touch if you are organising an event and would like it listed on the blog. What were the results of last year’s study? Last year, around 2,400 people took part in Stoic Week worldwide. Our findings supported the view that Stoicism is helpful. Participants reported a 14% improvement in life satisfaction, a 9% increase in positive emotions (joy increased the most of all emotions, whilst optimism increased by 18%) and an 11% decrease in negative emotions. The findings also supported the view that Stoicism not only increases well-being but also enhances virtue – 56% of participants gave themselves a mark of 80% or more when asked whether it had made them a better person and made them wiser. What else can I look forward to during Stoic Week? On the Stoicism Today blog during Stoic Week, there will be personal testimonies of how Stoicism has been useful in people’s lives, as well as articles tackling various stereotypes of Stoicism, and reflections by prominent authors on Stoicism and its uses in the modern world. Get in touch if you would like to share reflections on how Stoicism has been helpful in your life. Stoicism in Schools: Are you a teacher? We are working on developing a two-page lesson plan for introducing Stoic philosophy in school. Please check back often or contact us for more information. Stoicism in the Media: If you would like to run a feature Stoic Week, please get in touch. You can read of the previous media interest in Stoic Week here. Please share this page with anyone you think might be interested, and post it on Facebook and Twitter. Stoic Week’s twitter account is @StoicWeek. 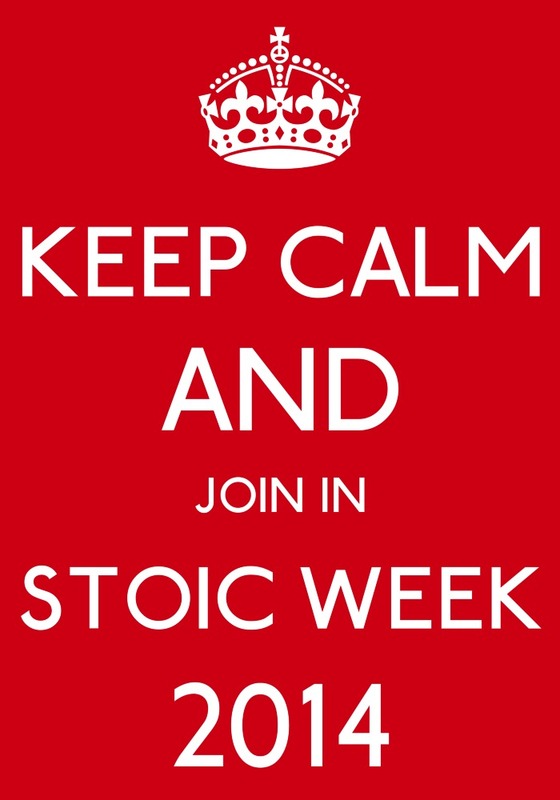 The Facebook page for Stoic Week 2014 can be found here.